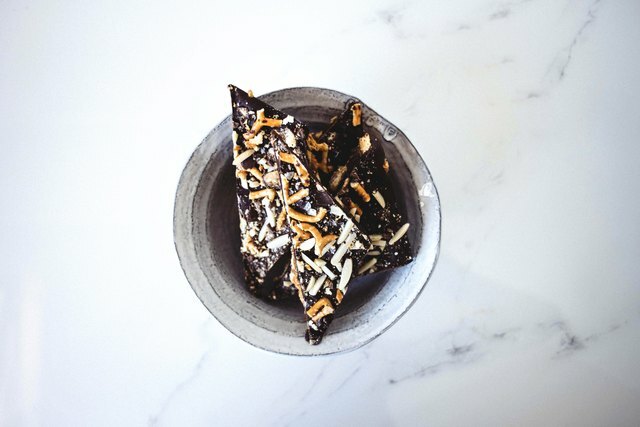 This decadent treat is sure to satisfy everyone's sweet and salty cravings. 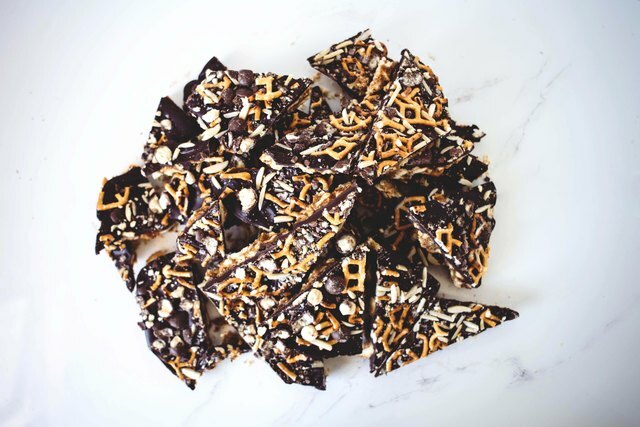 With a toasted Ritz cracker base, our chocolate bark features a crisp honey-comb crunch, pretzels, almonds, chocolate coated malt balls and a sprinkling of flaky salt. 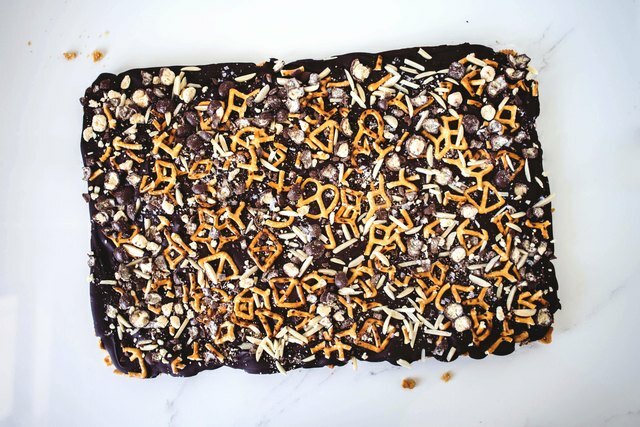 You can also customize it to your personal taste preferences making it not only an indulgent dessert but an ideal Halloween confection or holiday inspired gift. Pre-heat the oven to 350 F / 170 C degrees. Line a baking sheet with parchment paper and set aside. 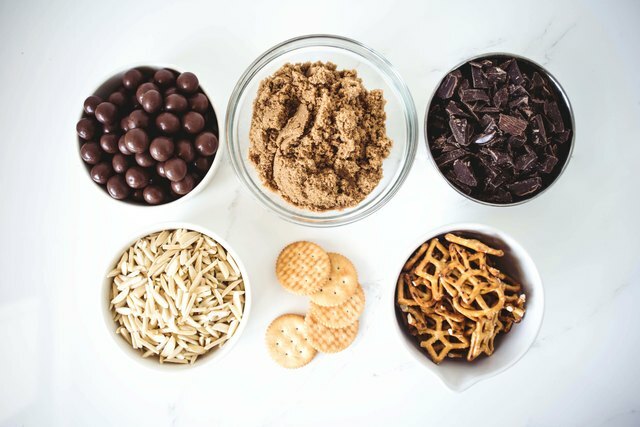 Prepare, measure and organize all the ingredients needed. In a medium sized bowl, coarsely crush the Ritz crackers. 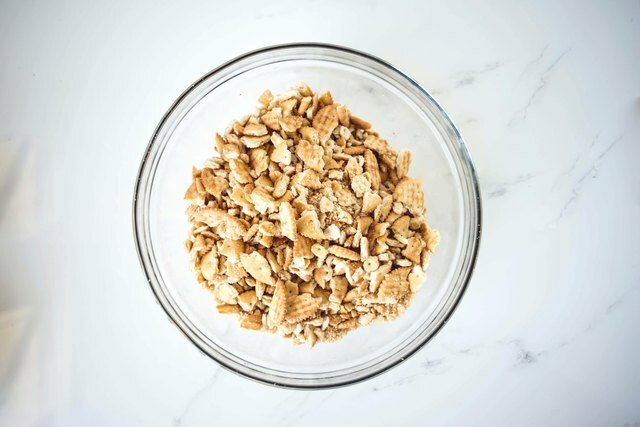 Transfer the crushed crackers onto the prepared baking sheet and toast in the oven until golden brown, 10 to 12 minutes. Remove and let cool. In a medium-sized saucepan, heat the sugar, honey and butter over medium heat, stirring occasionally until combined. 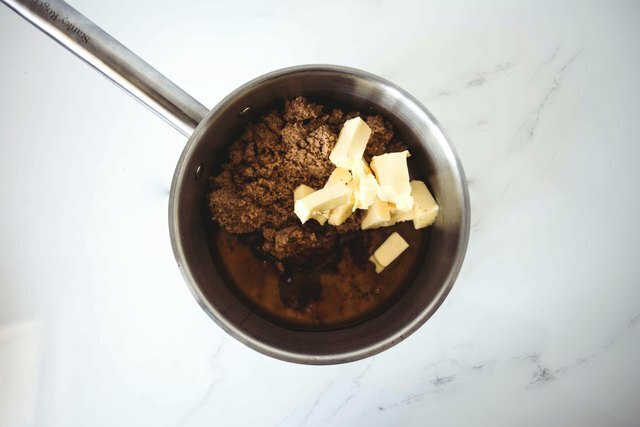 Once the butter has melted, fit the saucepan with a thermometer and cook, stirring occasionally until the temperature reaches 300 Fahrenheit / 150 Celsius degrees, about 10 minutes. The mixture will be thick, bubbling and amber in color. Remove the mixture from the heat and stir in the baking soda. Be careful... the mixture will bubble up! 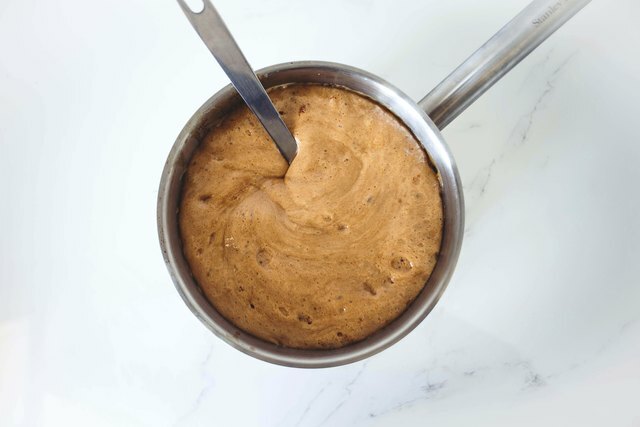 Quickly pour the mixture over the toasted crackers, spreading it evenly to cool. Let cool completely whilst you prepare the rest of the toppings. 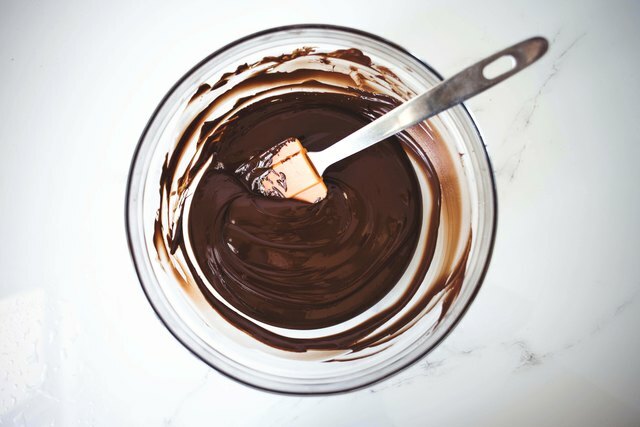 Set the finely chopped chocolate in a medium sized bowl over a saucepan of barely simmering water. Do not let the base of the bowl touch the water! Stir until melted and smooth. 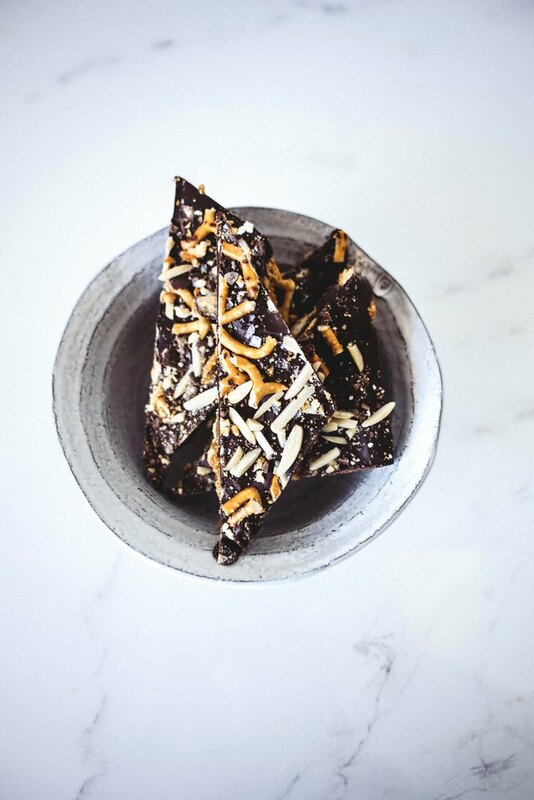 Drizzle the melted chocolate over the cooled cracker and honey-comb base. 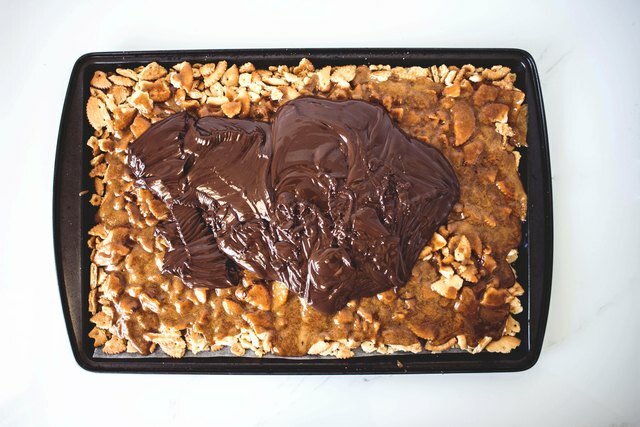 Use a spatula to spread out the chocolate until smooth and even. 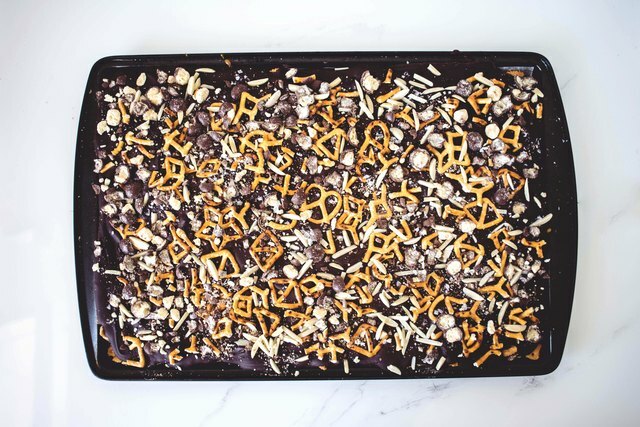 Immediately sprinkle the pretzels, almonds and add-ins of choice over the entire top, followed by a sprinkling of the salt. 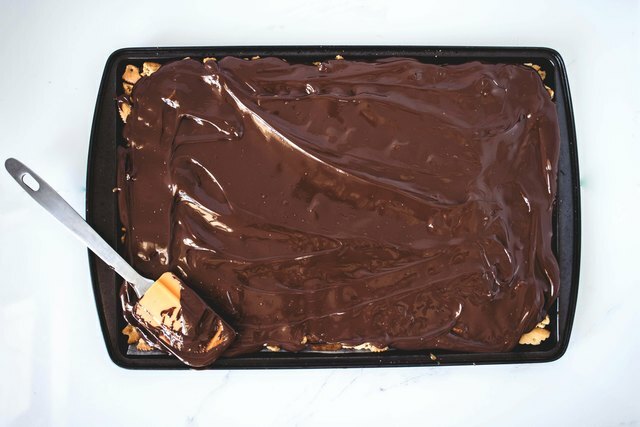 Place the chocolate bark slab in the freezer and chill until the chocolate top has hardened, about 35 minutes. 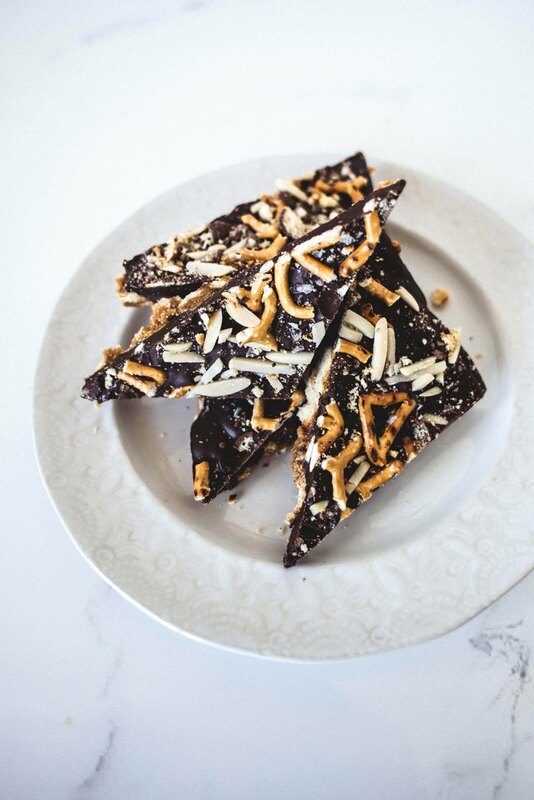 Once the chocolate has set, break the bark up into small pieces. 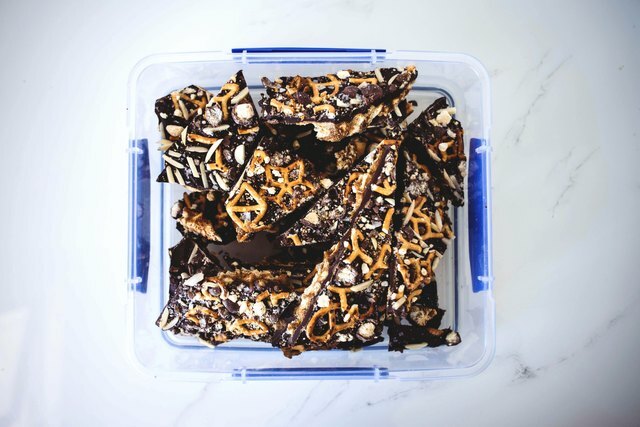 Store and chill the chocolate bark in an air-tight container until you're ready to serve. The bark can be made up to 3 days in advance.